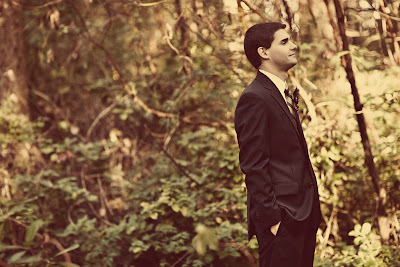 The first look is another moment that LDS brides forgo, although I'm not sure why. 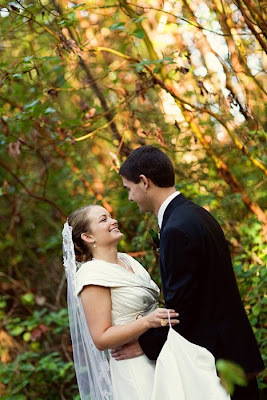 There is no "walking down the aisle" moment in the temple, and for us, it was how we found time to connect and take a breath before we were married. There is not much that can be said about a first look moment, as they are all pretty much the same. 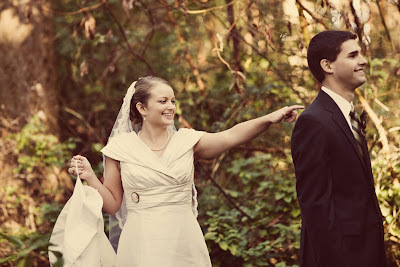 The groom waits, the bride sneaks up, they both have a "moment". 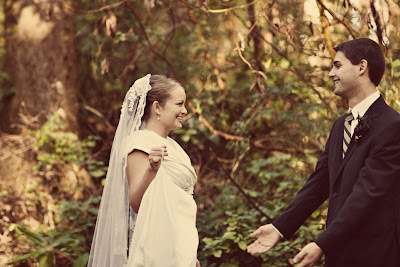 Though, somehow, to each couple that moment is made of personalized magic. It's smells like passion and it feels like love. Even if you had been there you couldn't have fully experienced it. That's what I like best about the first moment. It was a moment just for us. 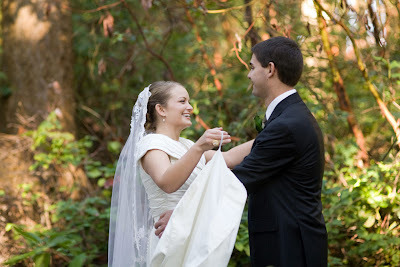 First Look from Jenna on Vimeo. 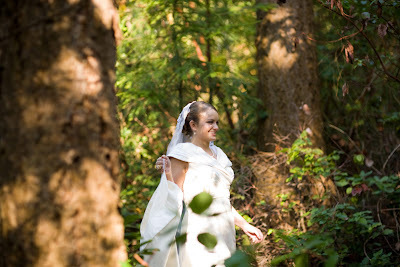 The blushing bride attempted to tiptoe up silently, but a bed of sticks on the forest floor made this impossible. So it sounded more like she lumbered up, sloppily. I wanted the tap to be slow, drawn out, a moment filled with tension and suspense. Instead I reached up and tapped quickly and excitedly. It's hard to do things slow on such an exciting day. and he approves! He had previously warned me that he might, and I quote, "hate my dress and find that pretending to like it would be impossible." From here on out you know the story. We kiss, I twirl, we kiss again, and maybe another time for good luck. I clap with glee, because clapping is what I do. I guess I forgot the lesson my mom gave me in train carrying already. Oh hello friends! Did you enjoy the show? 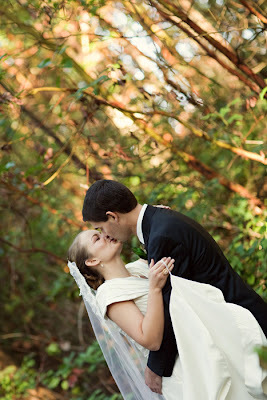 That stalker photog hiding in the bushes and watching us make out during our first look? It was Kelli Nicole! Aw, you're so cute! Loved the video. I just got some video from Birdy yesterday and I'm so excited to post some of it soon! I love those pics! You two look so happy! Thanks for sharing! Awww, this is gorgeous! The photos are stunning, but there's something just so perfectly "in the moment' about a video. That's why I enjoyed editing ours so much! You guys are the cutest. So cute. 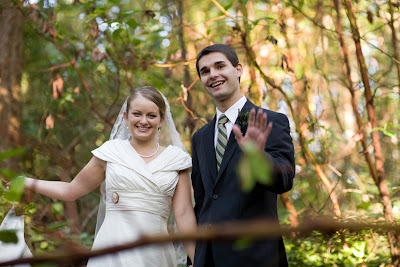 I love the last picture of you guys waving to your photog. I love how brutally honest TH is... warning you that he might hate the dress and not be able to hide it! We did our opposite... I waited for him, and he rode the escalator up to the top of a gorgeous hallway and used a cheesy pick-up line on me when I was facing the other way. 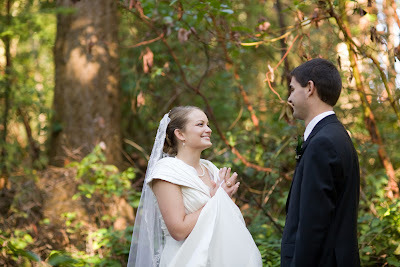 We forgot that our entire bridal party was down below at the bottom and could still see us, and they all hooted and hollered and cat-called when we kissed. It took away from the romanticism of the moment, but then again, sappy and romantic isn't exactly how we roll, so it was very fitting. Jenna, I loved the video! So sweet! I couldn't really hear you guys, but you both just looked so happy and excited. Maybe I'm just overly emotional right now but oh my gosh it made me cry! LOVED it. Awww that is such a cute moment, and to have it on film on top of it. You can see the emotions and the excitement and the love in both your faces. Really sweet. 3)His mom jumped in front of me to hug my husband. Arrg! So not fair. 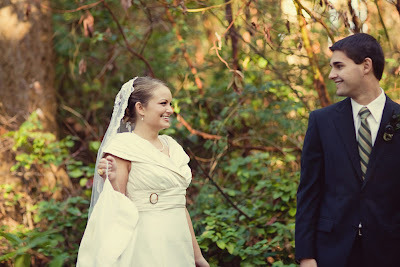 But hey I saw him that morning and it was still nice to see each other in our wedding outfits for the first time.